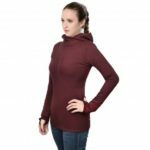 This sports tops features long sleeves, turtleneck, pullover closure and slim silhouette, shows your perfect body curves, suitable for yoga, running, exercise, fitness, sports training, leisure activities. Adopting high stretchy polyester fabric, wicks moisture very fast, which keeps you clean & dry. Pullover closure, easy to dress up or down! Slim style shows your slender body curves. Looks great with leggings, pants and shorts. Perfect for yoga, exercise, fitness, any type of workout, or everyday wear.